Ismae escapes from an abusive arranged marriage with a brute. When she arrives at the convent of Saint Mortain, the cloister of killer nuns inform her the god of Death has blessed her with violent powers and, should she accept to train under them, a great destiny. After she chooses to train as an assassin, she is given her first mission: kill a man residing in the courts of Brittany. But matters complicate once she begins falling for the very man she’s ordered to slaughter. I absolutely adore the main character, Ismae, who needs no knight in shining armor, but didn’t let that blind her from the possibility of love. Too often books feature a “strong” female who cripples when their love interest departs, proving how strong they actually are. But my favorite aspect of this book is how women, hurt not only by men but by society’s limiting expectations, unite to heal while taking revenge on the men who have endangered other women. Ismae develops lasting friendships with females, instead of the usual girl-pitted-against-girl trope. 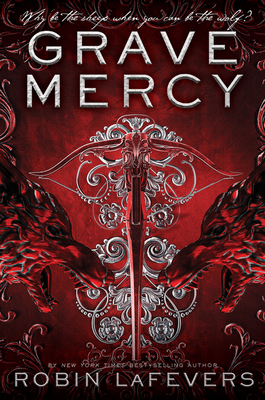 If you’re in the mood for a refreshing combination of historical fiction and fantasy, GRAVE MERCY by Robin LaFevers is definitely the right read! Another bonus: this is just the first book of the His Fair Assassin trilogy, so there’s more to look forward to after you’ve turned the last page. Grave Mercy is available in stores now. Find it's sequel, Dark Triumph here!